We are so caught up with what we ‘know’ that we forget to be amazed by the mystery, and all that we as of yet do not ‘know’. 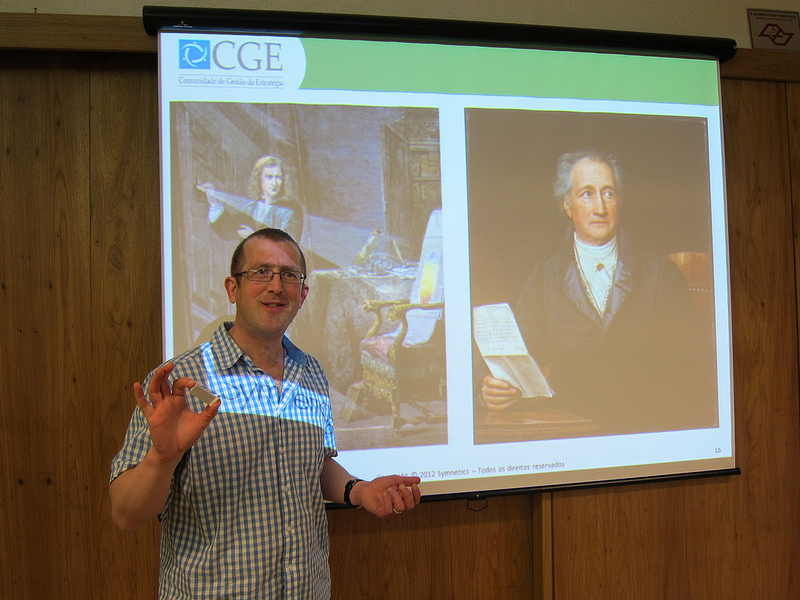 In my dissertation I explore a holistic, phenomenological way of seeing through the work of Goethe, which challenges this separated knowledge; inspiring and reinvigorating a sense of wonder with the world, and re-connection to nature. I feel that the re-cognition of the world which is achieved through this holistic way of seeing is fundamental for any attempt at ‘Sustainability’ and that only through inspiring wonder and deep connection with life, will we collectively imbue our actions on the Earth with the respect and reverence needed for us to survive. In re-cognizing the wholeness of nature, we are re-cognizing the nature of wholeness and what it truly means to be whole, and part of a whole, on this earth. Both Maria and I worked hard in the design of this workshop for the community, beginning the day at an extremely abstract level of intuition, sensing and feeling, then with me looking at limitations in thinking, paradigms and frameworks, and only then really getting down to the nuts and bolts of business strategy, having opened the minds of the community members, giving them a much broader sense of what it is to be sustainable. 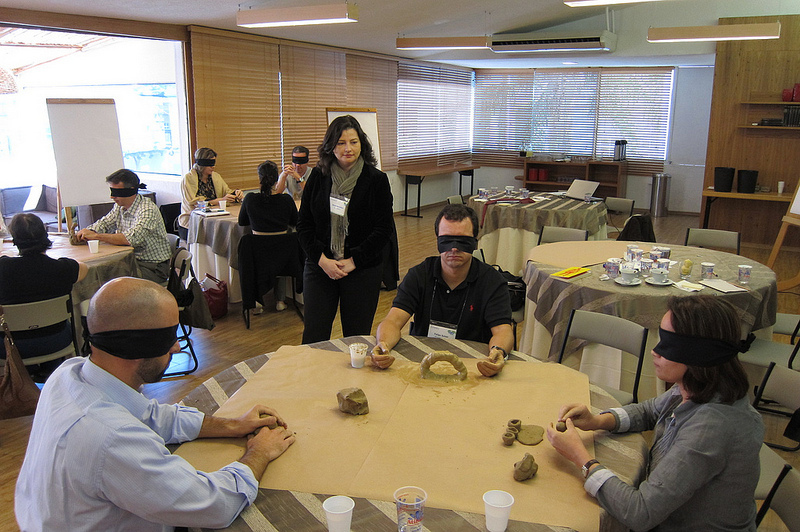 In part one of this article, I mentioned that I opened the session with a short meditation. I spent the next few minutes outlining the themes of the day, and then Maria introduced the next exercise, designed to help everyone explore sustainability not through their thinking minds, but via the sense of touch, feeling and intuition. 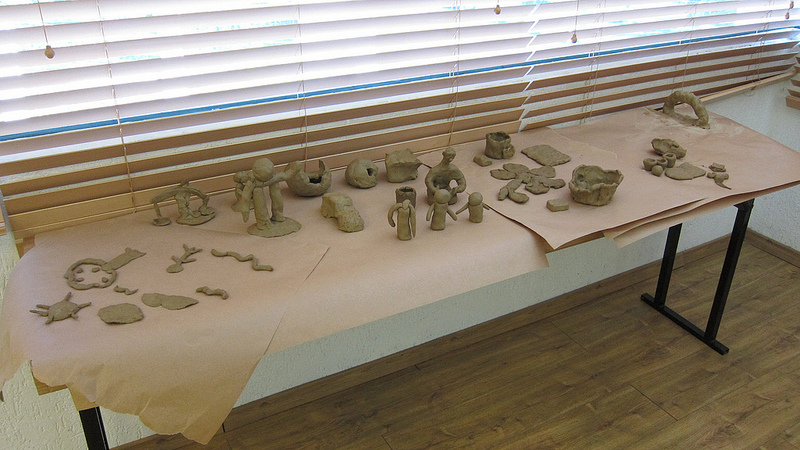 In this exercise, everyone was given a blindfold, and then given a piece of clay which they could then shape and mould in any way they wished, to create a piece of art which expressed their connection to nature. In the background we played a audio track of birdsong and flowing water, and this maintained both their meditative states, and engendered a sense of being immersed in nature. 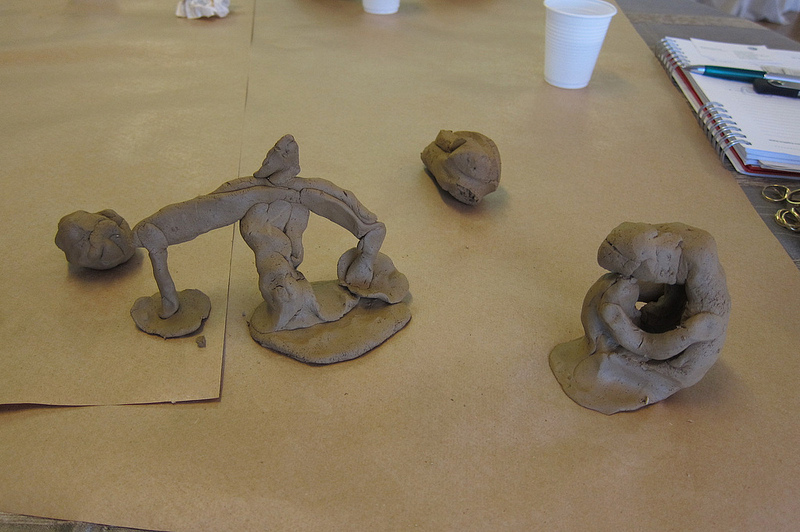 It really was quite remarkable not only what was created in clay, but the insights that everyone shared during the discussion of this exercise. I will now share some of these insights below. Background centre – two abstract creations. Foreground, man in equilibrium, VW car, tree and two children. Henrique created a sphere in which he placed one of his fingers. He spoke with his finger still inside. At first he started to think about how man is destroying the environment, but then as his finger played and then went inside the clay, it made him realise that nature also protects mankind. He realised that although we do interfere with nature, if we do so in equilibrium, the environment will protect us. Patrícia also made a similar abstract shape which was wrapped around her hand. This also had the same message; if we take care of nature nature will take care of us. 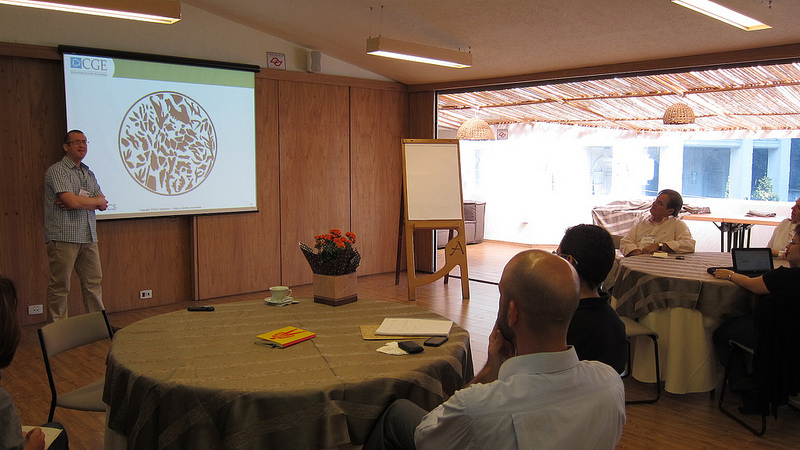 João remembered Satish Kumar’s keynote speechat last year’s Strategy Execution Summit, also managed and run by Maria. He was thinking about the circular nature of recycling, but created an arch as he also wanted to create roots, showing how we have the same roots as nature. It was wonderful to watch Felipe, as he finished quite early and was able to really meditate on his creation, as you will see in the photo of him with Maria above. Mônica made some recycling pots, and began by telling us how her group at work do engage in many sustainable activities, such as recycling and reducing energy consumption. She told us how when her new babysitter came, she asked what her company’s recycling programme was, and this made her realise that although she was sustainable at work, she was not taking this thinking with her back home. Carla made a point that the sounds of the river and birds had taken her back to her childhood, and so she had made a tree, a river, sun and grass, reminding her of playful days. Pedro told us that in fact he had not thought about sustainability until he had children, when his outlook changed, and so he created a father and child next to a tree. 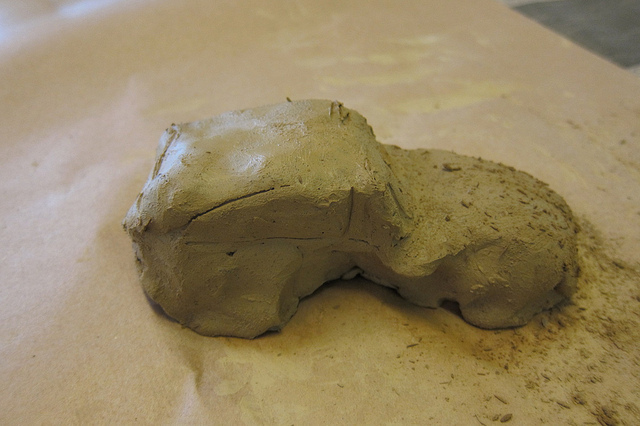 Nicolas from a car manufacturer created a car and depicted sand too. He is very proud of what his company is achieving in terms of making their products recyclable, and also he too likes to be out in nature to relax. 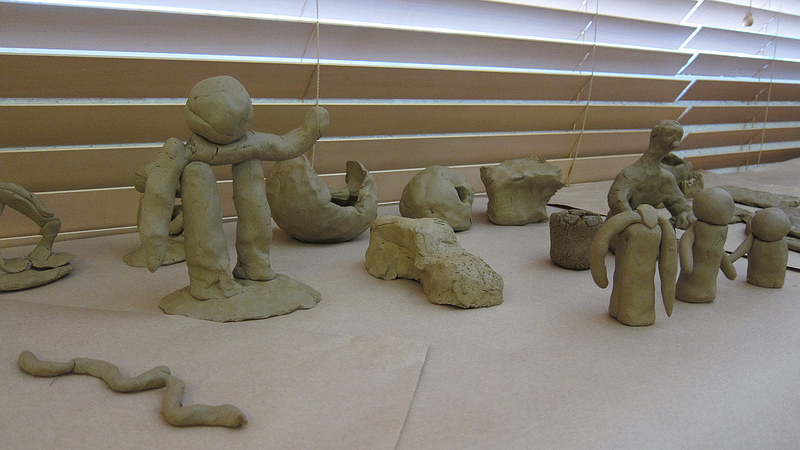 Some figures of men and women were created. Jayme had wanted to create a man with a much larger head than body to show how much our thoughts have the desire to control nature. What happened in his figure was that one arm did indeed partly break, as if to show this damage within the model itself. 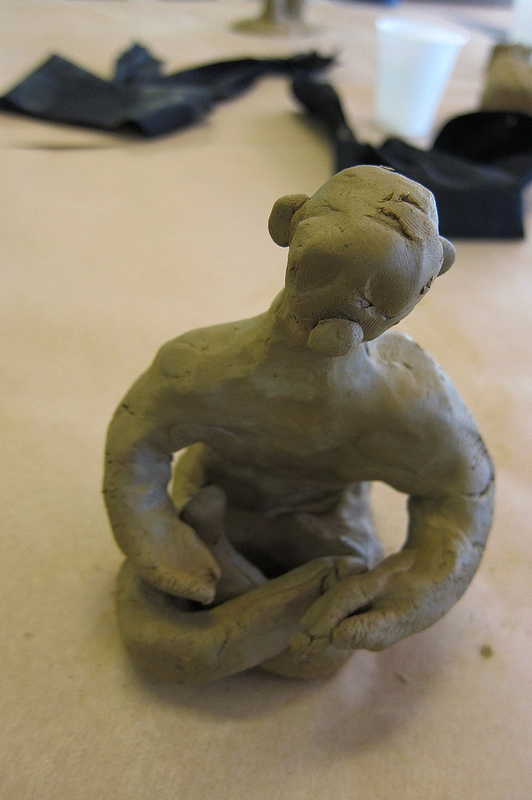 Roberto created a man in a meditative lotus position, to show how happiness comes from within, and not from external objects. This generated an interesting conversation as Maria suggested that it is the relationship we have with other objects that leads to happiness as well. And finally Alice created a mother and child in an embrace, which for her best represented our mutual relationship with nature, each embracing and protecting the other at the same time. Alice also said that at her company, two maids are also instructors in the company recycling scheme. This is fantastic to see an organisation realise that each and every member of the organisation can contribute creatively to a programme, and that ideas do not always depend on those at the very top of the hierarchy. This was the first time I had taken part in this activity, and it was extremely powerful. Everyone was entering into all four ways of knowing (thinking, sensing, feeling and intuition) and this triggered these wonderful insights of our relationship with nature, insights which could not always be fully articulated in language. After our coffee break I spent the next half hour looking at mental models, how our thinking can be limited, and how our seeing, what we see in this world is driven by our theories and what Henri Bortoft calls “active ideas”. The figure you see in the photo above comes from Henri’s book The Wholeness of Nature, and after discussing this figure, we also looked at Goethe’s theory of colours, comparing his scientific approach to that of Newton. Henrique had brought a book “O homem que sabe” by Vivian Mosé with him. This references Goethe, Schiller, and many other philosophers. I said to everyone that this was a great book, but now we are really going to experience directly the ideas that were being discussed in the book, and hence access the ideas in a different way to our representational logical thinking minds. Henri Bortoft calls this “doing philosophical work” and for me it is far more important than discussing philosophy. Through Henri’s work we can come to experience the ideas of the great phenomenological philosophers, and perhaps it is only when we experience the ideas directly, as opposed to contemplating them through language and abstract symbols, that we can fully appreciate their power, how these ideas enable us to comprehend complex systems at a very deep level, and how these ideas can be applied in business. I closed my presentation with three thought-provoking slides. 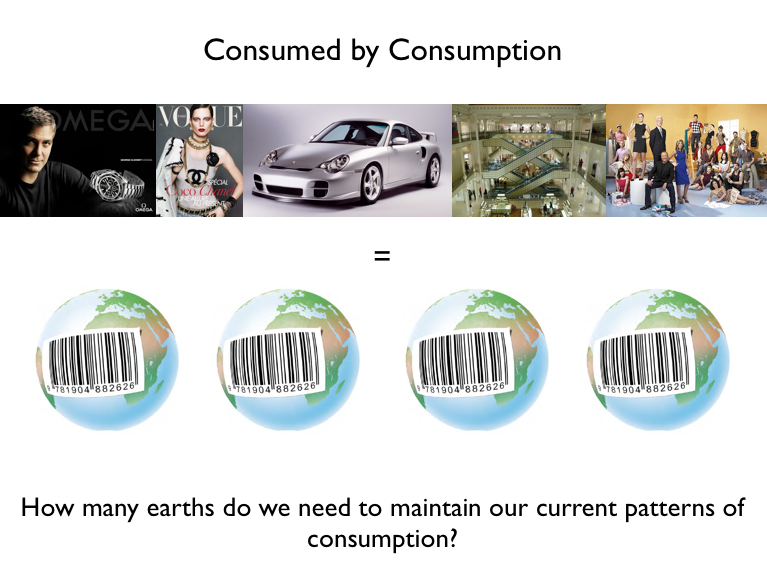 I first discussed our levels of consumption, and the fact that we are consuming more resources than our planet can replenish. 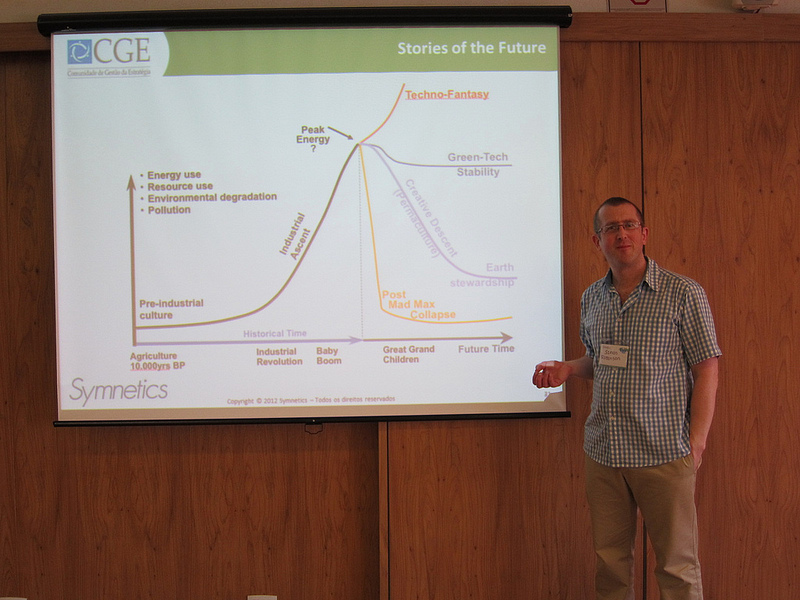 I then used Rob Hopkins’ slide from the Transition Towns movement, which looks at stories of the future, and what our vision of the future is. Can we continue to grow indefinitely, should we level off, should we become guardians of the planet, or will we experience systemic collapse? 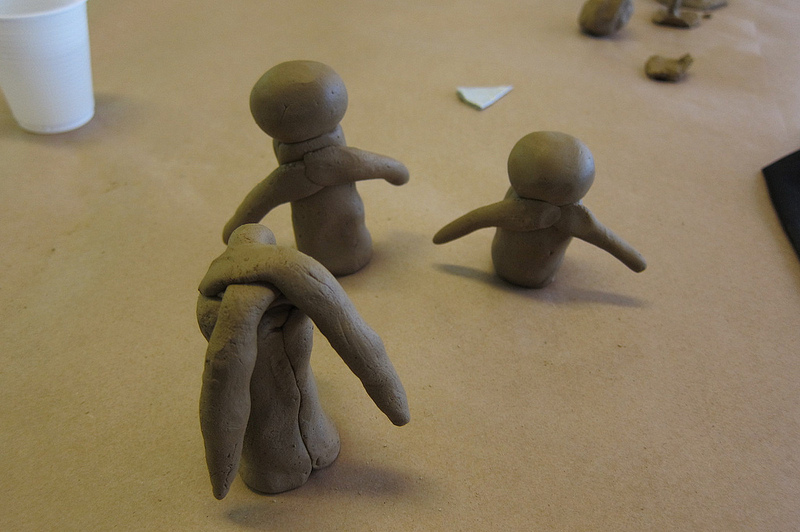 I then finished by looking at a model being developed by Oxfam, and inspired by the work of Johan Rockström. I really wanted to make the point that we in developed countries are not always trying to tell developing countries like Brazil that they have to not grow. 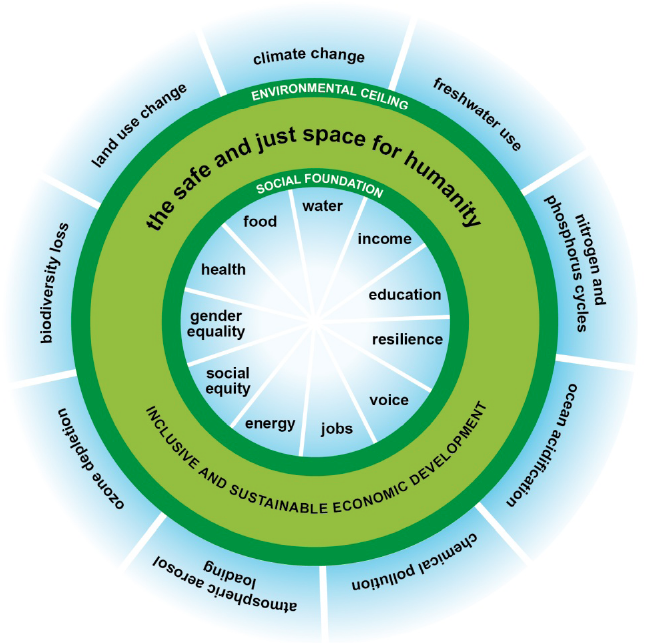 What this diagram above shows is that we have a twin challenge of both protecting our planet and working towards a fairer and more equal society, where people do not live in abject poverty and starvation. Following on from my short presentation, we ran a world cafe, enabling everyone to discuss the issues raised in depth and to explore what sustainability meant to them. We had three tables, and the questions addressed were i) what is sustainability? ii) what is sustainable development and iii) what is your organisation’s story of the future? These topics generated a huge amount of debate and discussion, which took us up to lunchtime. I made a few observations and answered a few of the questions which were raised, but saved other answers for the afternoon where I would have slides to help illustrate the points I would make. In the afternoon, we really got down to the business side of sustainability, with me presenting a number of business cases such as Patagonia, Gore Associates, Kyocera and Simplicity Computers. 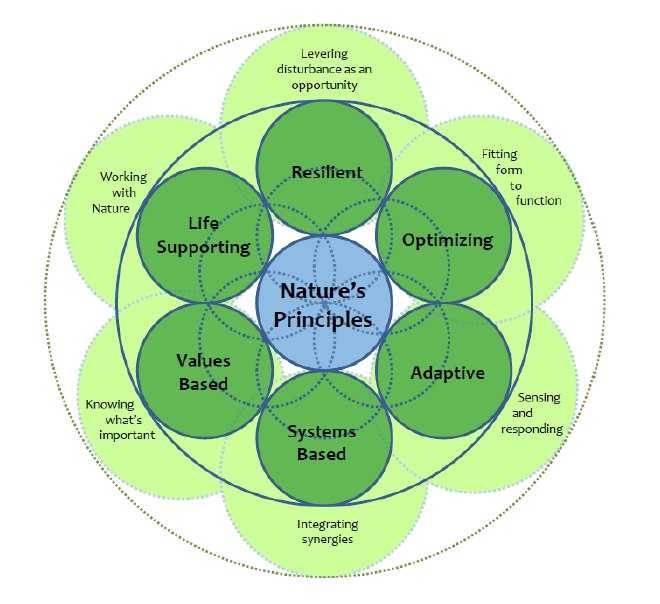 I showed the model developed by BCI network (Biomimicry for Creative Innovation) which goes into detail on exactly how a business can be inspired by nature. I then introduced the Transition Towns Movement, and Maria also talked about how the Transition Movement works can also be equally applicable in a business context. In part four of this article, I will discuss Maria’s presentation on sustainability metrics, Balanced Scorecard methodology and the concept of the triple bottom line. I will also provide links to these cases studies and materials, so you too can follow up should you be interested. I will also summarise my feelings and observations from yesterday, and really try and express exactly why for me, it is the most important dialogue group in Latin America.